Channeling my inner Mrs. Fields, and whipping up this tasty Thanksgiving pie alternative. A GIANT, chocolate chip pizookie (pizza + cookie = pizookie). We learned all the tips and tricks for how to make a pizookie that tastes like the best version of your childhood dreams. Such a fun and unexpected pie alternative for a nostalgic holiday like thanksgiving. Do you remember cruising the mall, passing Mrs. Fields, and seeing their HUGE cookies with frosting in the display cases? I always thought it would be so cool to receive one of those. Alas, it never came to be, and I’m pretty sure Mrs. Fields isn’t around anymore. So we are making our own pizookie, but with a Thanksgiving twist! 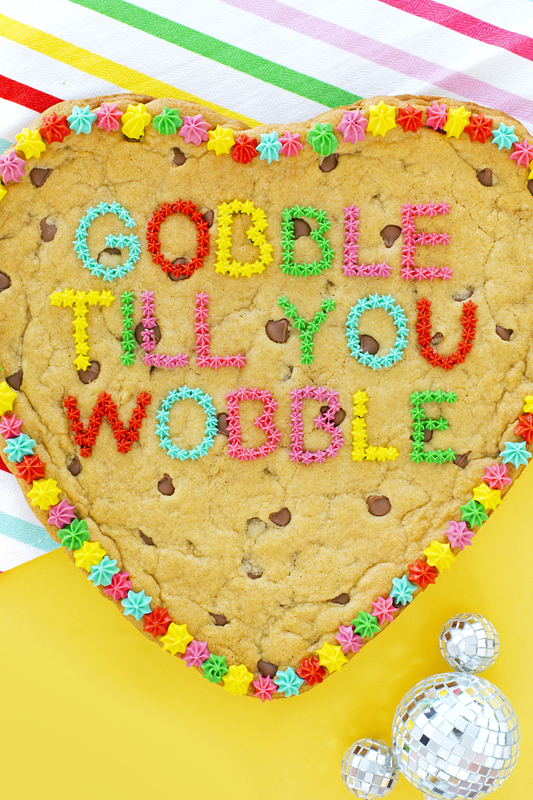 Because, every holiday should have a little something whimsical served alongside the traditional fare. What are the supplies needed to make this fun pizookie? 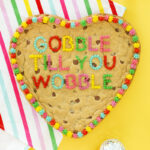 Before embarking on your pizookie making fun first grab these couple supplies. 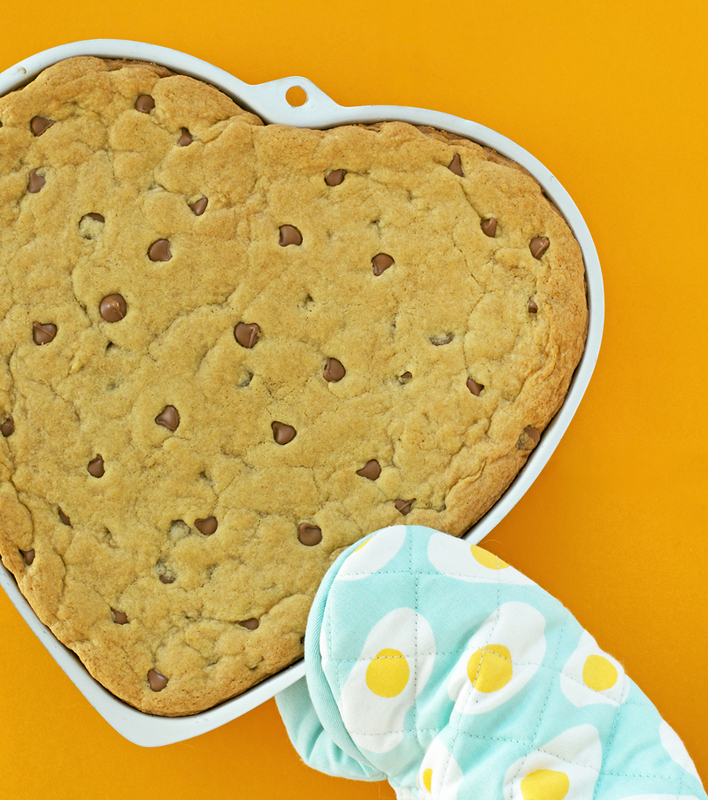 A heart shaped Pizzokie Pizza Pan to mimic this one. Step One: Start by mixing up a batch of your favorite chocolate chip cookie dough recipe, or grab a tube from the grocery store. Cream together the butter, brown sugar, sugar, vanilla, and eggs. Add the dry ingredients, and mix until combined. Mix in by hand, the chocolate chips. Prepare the pizookie pan. Now, I’ve seen enough disasters on the Food Network, or on the Great British Bake Off, to know properly preparing a pan is a must. So I traced the pans shape onto parchment paper, AND sprayed around the edges of the pan with non-stick cooking spray. Fill your pizookie pan with dough. From trial and error, I learned to only fill the pan HALF WAY FULL! I promise. If you fill your pan with more, it will bake over the pan. To fill my pizookie pan, I break my cookie dough into pieces, and then press the pieces together, completely covering the bottom of the pan. Bake the pizookie and 350 degrees, for 20 minutes. In a stand mixer, mix the above ingredients until you get your desired consistency of frosting, adding more milk as needed. For piping I like a thicker buttercream. If I was frosting a cake, I would like a thinner buttercream. Separate the frosting and color it as you desire. 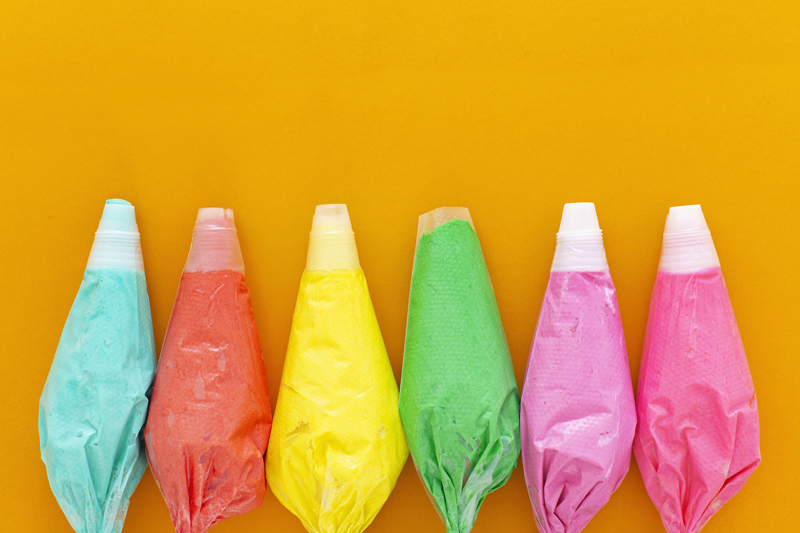 The brighter the colors, the better. When baking, you want to pull it out when the edges start to brown. Even if the middle doesn’t seem quite done, if the edges are starting to brown, pull it out. Nobody wants a dry cookie. Frosting tip * When it comes time to fill your piping bags, remembering to add a coupler, unless you have multiple star tips. I only have one star tip, and I was missing a coupler (as you can probably tell). So I need couplers to interchange the star tips willy nilly. When the pizookie is completely cooled, it should come right out of the pan. Remember, we aren’t making the same mistakes as those Food Network fools, wink wink. 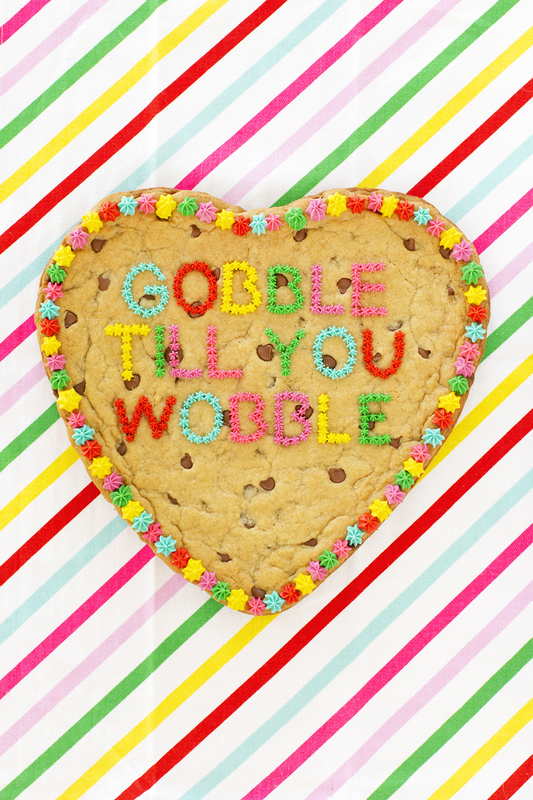 We took EXTRA measures to make sure the cookie came right out, and it did! HOORAY! Now, we are ready to pipe! Pipe a witty Thanksgiving saying, or a punny Thanksgiving pun on top of the pizookie. 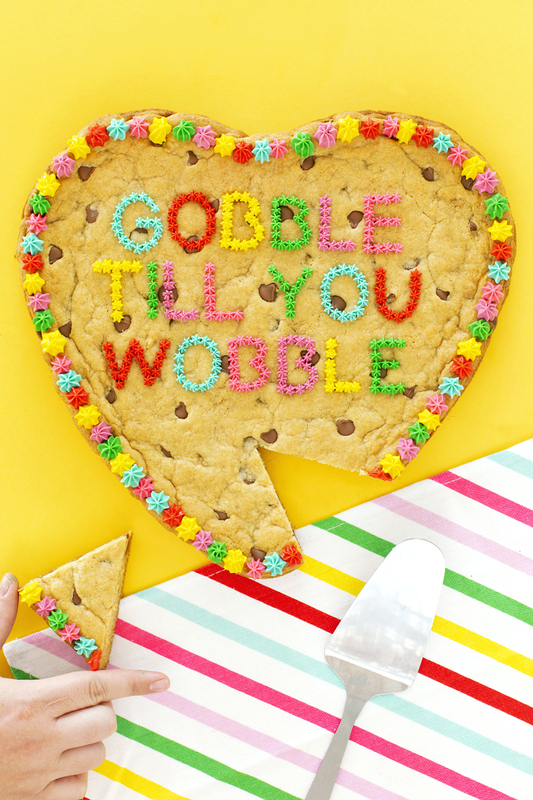 I like to write my saying on the cookie first, using an edible marker. Americolor has a great edible marker, and I think Wilton has one as well. 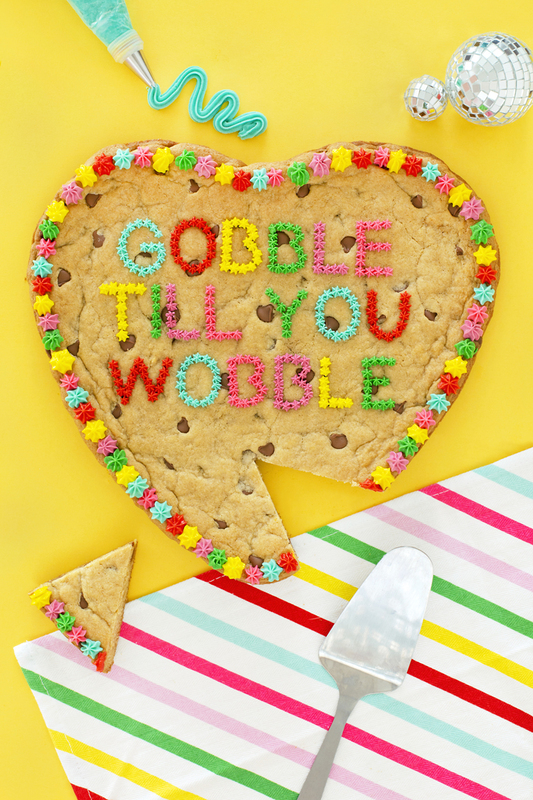 I guess you could say step eight is to bring your super cute Thanksgiving pizookie to Thanksgiving, and be prepared to say ‘thank you’ A LOT, because everyone is going to be complimenting you on your cute treat. 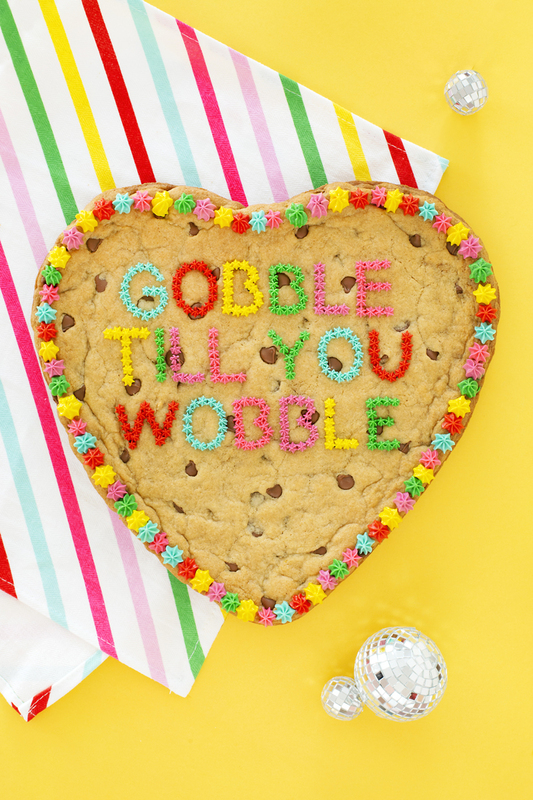 The pie haters, will probably be giving you big hugs, because they are so appreciative of your non-pie treat. Who doesn’t like a delicious chocolate chip cookie? Pie lovers AND pie haters will all line up to taste your tasty treat. Happy baking. Photos, and project creation @A Subtle Revelry by Brie Zacher. This is such a nice blog, Please keep sharing such posts.